Many parents (especially those new to homeschooling) aren’t aware of the parenting help that we offer! If you're part of a homeschool support group, if you're teaching a parenting class, or if you just want to use these for your own family and save, this discounted package gives you the best of our Biblical parenting resources at the greatest possible discount. 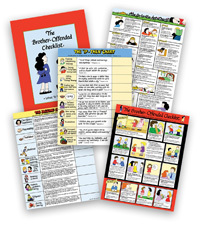 This discounted package (pictured above) gives you the most popular books and charts in Doorposts’ character training collection. Note: all charts come in the small, color, laminated format, as pictured above. All books are newest editions. 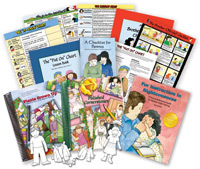 Purchased separately, the books and charts in this collection would cost $182.00, but we’ve packaged these resources together and cut the price down to only $147.00 (you save $35.00)! Note: If you're sharing these materials with your support group or a class, we will gladly send you extra copies of our catalog; just fill out our quick catalog request form. 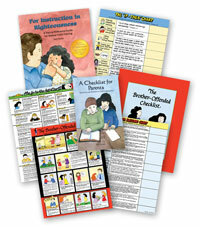 I purchased this complete set to use in our homeschooling and as a parenting resource. The amount of information and resources in this package is AMAZING! We will use all of these tools over the course of raising our children and are already implementing the use of the "Plants Grown Up" book and several of the charts. 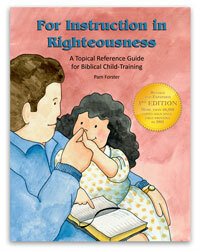 The biblically-based projects are engaging for little ones and are of sound principles. This is an invaluable resource for parents purposing to teach their children biblical principles and how to live an honorable life. 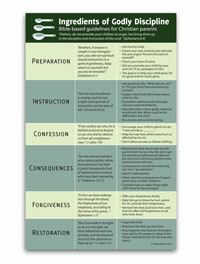 My husband and I participated in a parenting class at a local church and after a session on training children, the leaders held up the "Brother Offended" checklist and explained how they used it in their home. Everyone in the class was impacted (and convicted!) on how effective this chart was to use. What an important and valuable tool - even for adults!! !